Attorney Amir Fisher welcomes court decision to accept the petition against illegal Arab construction in Susya. Attorney Amir Fisher, who represents the village of Susya and the Regavim NGO, welcomed on Wednesday the Supreme Court's decision to accept the petition against the Arab illegal construction in the area. 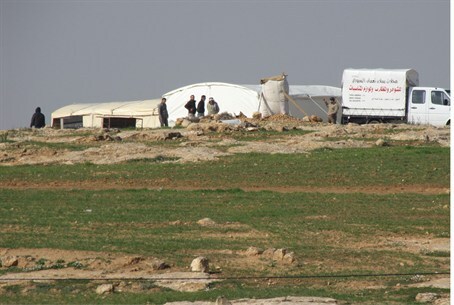 On Tuesday, the Civil Administration handed out demolition orders against 52 buildings and tents in Susya, which lies between Kiryat Arba-Hevron and Arad. Regavim, an NGO watchdog group for Jewish national property rights, filed the petition with the Supreme Court after it documented the Arabs building illegally on State-owned lands. Fisher told Arutz Sheva that the Supreme Court’s decision can be described as almost historic.